All India Anna Dravida Munnetra Kazhagam MP Sasikala Pushpa, who reportedly slapped Dravida Munnetra Kazagham MP Trichy Siva at Delhi airport on Saturday, was on Monday expelled from the party by its supremo Jayalalithaa on a day when she claimed she was slapped by a "leader" and faced threat to her life in Tamil Nadu. In a brief statement, Jayalalithaa said that Sasikala, a Rajya Sabha MP, was being expelled from all party posts, including primary membership, as she had acted in violation of the party principles and ethics for "bringing disrepute to the party". "Her behaviour has brought great disrepute to the party," the Tamil Nadu chief minister said in Chennai. She asked party supporters not to have any truck henceforth with the Thoothukudi-based MP. In Rajya Sabha, Sasikala alleged she was being forced to resign from the 'constitutional post'. She first rushed into the Well of the House to get permission to make her statement and then broke down several times as she said she faced "life threat" from state government and alluded to her being slapped by a "leader". She, however, did not make it clear who slapped her and when. Outside Rajya Sabha, Sasikala claimed her expulsion had no link with the airport incident involving Siva, also a Rajya Sabha MP, and that pressure was being put on her for the last two months to resign. She replied in the affirmative when asked whether Jayalalithaa was behind this. Sasikala also claimed that she was warned of consequences if she does not resign. Raising the issue in the Upper House, she said "If an MP is being slapped by a leader, where is human dignity," triggering strong protest from members of her own party. 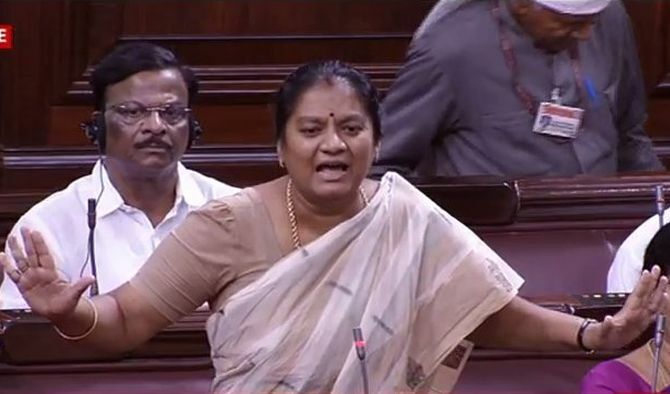 As she found support in opposition members who wanted the chair to allow her to make her full submission, AIADMK's A Navaneethakrishnan walked into the well and out of it multiple times demanding that her remarks be expunged. "I have life threat... I am being compelled to resign from my constitutional post," she said. "Where is women's safety in this country? ... I am being harassed. I need protection. In Tamil Nadu, I don't have safety. There is threat to my life." Meanwhile, Sasikala thanked Congress President Sonia Gandhi and Vice President Rahul Gandhi for their support. "I want to thank Congress party governed under Soniaji and Rahulji, Because they have supported me today and then I want to thank DMK which has supported me today even though there was an issue," Sasikala told NDTV. Asked if she would now join Congress, the former Tuticorin mayor said,"I don't know." Sasikala said she was thankful to her party leader for sending her to Rajya Sabha but "if a leader can slap an MP, I need protection. I need government's protection." "I want to serve the country (and not resign)," she said. "I am not here in Rajya Sabha for any benefit." Deputy Chairman P J Kurien said the Chairman was custodian of all members of the House and he will protect her too. He, however, asked her not to mention anyone's name who cannot come to the House to defend himself or herself. The aggrieved member can write to the chairman for necessary action, Kurien said. But the opposition benches broke into protest saying she should be allowed to make her full submission. Women members of the Congress moved to the aisles and vociferously raised the issue of her plight as a fellow member.